Full Rubber Protection Mat Set. 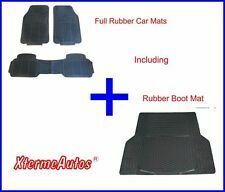 Includes Front & Rear Rubber Mats Rubber Boot Mats For Estate Cars. Universal Car Mats. Not Tailored to Direct Fit. May Need Alteration. 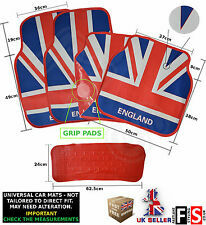 UNIVERSAL CAR MATS - BRITISH FLAG. Excludes scottish highlands, ireland & northern ireland. Heavy Duty Rubber. Add some colour to your vehicle's interior with these heavy duty hard wearing mats. Comes as a full set with two rear and two front mats. Should fit 99% of vehicles and can be trimmed to make a better fit. 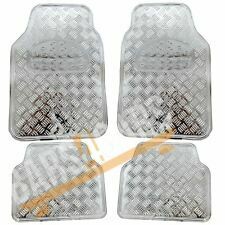 4pc Car Mat Set (Clear)Transparent. 4 Piece Transparent Style car floor mat set. Super heavy duty, transparent mat set, a quality product accessory. Simply, ideal for your car! Trimmable: easily cut to fit your original mat or shape of the area to be placed. 4pc Car Mat Set. Uniquemodern design combined with ahigh quality materials that makes this car mat set one of the best choices on the market. Made from durable materials with thickness behond belief completed with a stylish finish - as you can expect from a premium product! EXTRA HEAVY DUTY BOOT LINER. - Extra Heavy Duty. - Zipper, tie and button fastenings. - Folds flat for storage. - Wipe clean material. Protect your vehicle's interior with these heavy duty hard wearing mats. Comes as a full set of full length rear and two front mats. Should fit 99% of vehicles and can be trimmed to make a better fit. Extra Heavy Duty Rubber Bootliner Mat - Size: 108cm x 140. THIS IS A UNIVERSAL HEAVY DUTY CAR BOOT LINER. Need a dog guard as well check out this unbeatable deal. We at Bars4Cars specialise in roof bars, vehicles mats, wheel trims and other vehicle parts and accessories. Universal Car Mats. Not Tailored to Direct Fit. May Need Alteration. Excludes scottish highlands, ireland & northern ireland. Heavy Duty Rubber. Universal Car Mats. Not Tailored to Direct Fit. May Need Alteration. Heavy Duty Rubber. Key Features. Logo/Label: 'Perrys' Logo stitched on Driver's Mat. Compatibility: Non Tailored Carpet MatsUNIVERSAL FITTING. Material: Needle-Pile Carpet. Feature 2: Protective heel pad on driver's side floor mat. Our floor mats are specifically designed for quick and easy installation. These Rubber Chrome Style Car Mats come as a Complete set of Four, Two Mats for the Front and Two for the Rear of your Car. Heavy duty protective boot liner ideal for pets,transporting waste to the tip or keeping you boot in clean order. Waterproof heavy duty PU backed polyester material. 4 PIECE FRONT REAR BLACK CAR MAT RUBBER NON-SLIP GRIP UNIVERSAL FLOOR MATS. The mats are as pictured. A universal shape which fits in most cars. The universal mats are not specifically tailored to fit the car you are buying them for. 1 x Car Sound Deadening. -High density,High-quality high-density foam, noise performance stronger. -High flexibility,Flexible, easy to install soft, no bending does not crack. -Thick back paper,The use of thick kraft paper to avoid rupture during construction. Universal Black PVC Car Floor Carpet Pad Heel Foot Mat Pedal Patch Cover 25x16cm. Fit:Universal (wire ring pads, leather pads, nest pads, etc.). Included: One Pc Carpet plate with 4 pcs screws. Special Features:All weather,Waterproof, Custom fit. The mats are as pictured. A universal shape which fits in most cars. The universal mats are not specifically tailored to fit the car you are buying them for. AP AUTOMOTIVE 4 Piece set of universal car mats. 4 Piece Heavy Duty Universal Fit Black Rubber Car Mat Set. Keep the floor of your vehicle clean these universal carpet mat set with stain protector and extra rubber detailing. - Universal shape to suit all vehicles. 1m 1m 10mm Car Soundproof Noise Insulation Sound Deadener Acoustic Foam Material. - Ultra thick(10mm) waterproof thermal closed cell foam. 1 x Soundproof insulation foam. - Give you a quiet driving space, greatly improved driving comfort. Easily Cleaned by Brush. The mats are as pictured. A universal shape which fits in most cars. The universal mats are not specifically tailored to fit the car you are buying them for. AP AUTOMOTIVE 4 Piece set of universal car mats. Keep the floor of your vehicle clean these universal carpet mat set with stain protector and extra rubber detailing. 4 Piece Heavy Duty Universal Black Rubber Car Mat Set. - Universal shape to suit all vehicles. High quality tri-layer, twin density lightweight foam laminate. 5, You can also use on car roof floors, hood, firewall, chassis, trunk room, trunk lid and so on. Do not cover the chassis wiring or air holes. Material: Aluminum foil. Waterproof & fire resistant: Yes. Remove the isolation paper and stick the heatinssulation pad in the angine covers. Clean the dust and oil which cover the place you want to. Can make the heat of the engine evenly distributed to avoid overheating the lid. 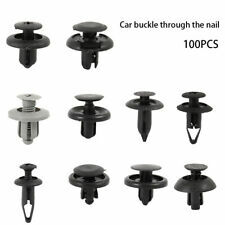 240X Mixed Fastener Clip Retainer Rivets for Car Door Panel Fender Liner Bumper. Vehicle Car 10-Way Standard Blade Fuse Holder Box with LED Indicator 20x Fuses. Large Size Clear Plastic Disposable Waterproof Car Cover Rain Dust Snow Garage. 5PCs/Set Universal Car Floor Mats Front & Rear Carpet Auto Black Skidproof Mat. The safest car floor mat, cover perfectly 5pcs mat for 5 seats car. One step making, easy to clean by towel, nice and comfortable, always keep your car clean. 12pcs 10mm Thickness Car Sound Mat Proofing Deadener Heat Noise Insulation Deadening Mat Hood Closed Cell Foam 50 30cm. boot, wheel arch, body panels, load floor, under seat, floor, interior bulkhead. 240x45cm /94.5"X17.7" Universal Brown Flooring Mat Car Trunk Floor Carpet Foam. - Noise isolation: material enclosed structure, a good noise-isolation. -Non-skid EVA Foam Faux Teak Sheets provide unparalleled comfort and exceptional traction - even when wet! 1 x Teak Decking. -Non-skid EVA Foam Faux Teak Sheets provide unparalleled comfort and exceptional traction - even when wet! -Teak brown over black and can easily be cut down to fit nearly any surface on a boat where non-skid, or protection for the boat's surface is required. High noise reduction & thermal insulation properties. 5, You can also use on car roof floors, hood, firewall, chassis, trunk room, trunk lid and so on. Do not cover the chassis wiring or air holes. 1 x Soundproof insulation foam. - Ultra thick(10mm) waterproof thermal closed cell foam. - Give you a quiet driving space, greatly improved driving comfort. Material: Foam. - Easy to dry line anything that need to retain heat or sound or keep the sound or vibration out. 5pcs mats cover perfectly for 5 seats car. 5 Pcs Car Floor Mats. Other: Car Interior Accessories Surface Finish: PU. Alomost suit for all 5 seats left hand drive car. Color: Black. One step making, easy to clean by towel, nice and comfortable ,always keep your car clean.